Sorry, everyone, but my brain has gone completely and utterly on strike. I wanted to tell you about a new and amazing SPF that’s launching, a brilliant book I’m reading and a handy recipe that I’ve just tried out, but I seem to be in the vice-like grip of a particularly intense bout of PMT. Getting words out and onto the page is like the mental equivalent of trying to use chopsticks with boxing gloves on. I just. Can’t. Form. Sentences. Apologies; normal service will resume just as soon as…well. You know. 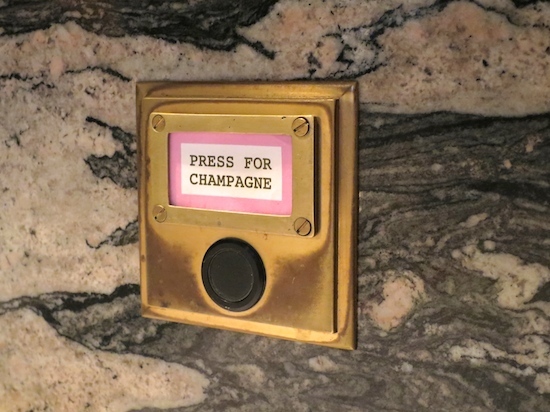 Quirky thing of the week so far: the “PRESS FOR CHAMPAGNE” buttons that are at every table in the Soho bar and restaurant, Bob Bob Ricard. You press the button and your waiter appears with the champagne list. What a nice touch!